Off by cab at 1pm to Pearson International with lots of time to spare. Met up with the Martins, McNaughts, Emmetts, Torries, Cosburns, Gwen Pulford, Ann Bia and Maria Angelica Nunez for a bit of pre-fligt schmoozing. Lizzie T was an unexplained no-show. It was a long, tiring flight to Charles de Gaulle in Paris, with no sleep for me, but nores from Larry. Saw dawn from the windows of Charles de Gaulle. The same group, less Ann, gathered for mutual support in what is, after all, a bleak airport. Left on-time for Russia and arrived safely, though by then very tired. The cruise rep met us as expected but we were delayed quite awhile because someone’s luggage didn’t arrive. Eventually we headed for the ship and had very little time to unpack before our briefing. That’s where we caught up with the other Intrepids who flew Lufthansa through Frankford. They had been here about 90 minutes before we arrived. They had lost 4 people along the way, but at least 3 of them will catch up tonight or tomorrow. A great dinner with the Emmetts and Kennedys. Then ready to shower and flop for the night. Up early after a restless night to catch the tour bus on the wharf. The 43 Intrepids commandeered a full bus to ourselves. The traffic was terrible, so it took a long time to get into the centre of the city. We noted that there are now very many new cars, a lot of them high-end, on the streets. Obviously, it’s prosperous here. Many buildings are going up – haven’t seen so many cranes since China! There are still lots of old, communist-era apartment buildings too though. It was a chilly, misty, overcast day, with quite a breeze, so we piled on all the layers we could. We stopped on a lakeshore across from Novodevichy Convent for photos, then to a viewpoint n Sparrows Hill. Next, on to walk near Red Square. Unfortunately, there was an event yesterday and workers were still removing platforms etc, so we couldn’t go far onto the square. We could see most of the great sights, though, from behind the barricades. We walked through the Gum Store [ Moscow’s old, main, merchandise-free store of communist days, converted to an ultra-modern shopping centre like a dressed up Eatons’ Centre ] and then rode the metro to 3 very different stations – not like Toronto for sure! - Crystal chandeliers, marble statues, beautiful paintings and very long, fast-moving escalators. From there we took the bus to Arbit Street where there are small vendors’ stalls, cafés and bars. Luckily for me there was also a pharmacy. With coaching from our guide I was able to purchase allergy drops for my poor, sore eyes. It was so damp, chilly and windy that we didn’t get too much pleasure from the walk, but we did see the kinds of souvenirs and other goods on offer. We were then taken to a small boat, where we enjoyed a cruise through downtown Moscow while eating. From there we went to the Novodevichy Convent. Though we couldn’t go inside, the grounds are beautiful and we heard stories of former residents [ mostly exiled aristocracy or unwanted wives ]. Then on to the associated cemetery, where many famous people are buried, and where many of the tombstones are works of art. Back to the ship for dinner where we were happy to learn that the last of our missing group members, Lizzie T, had arrived. The group of 44 is now complete! 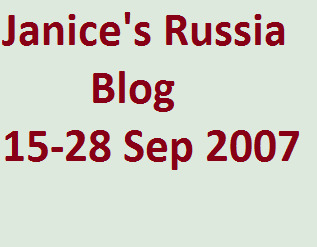 [ Lizzie mistook the departure date for Sunday ] Then out again to see Moscow By Night. Luckily it had warmed up, so we were very comfortable walking around. We stopped at a glassed in pedestrian bridge from which we could see the spectacular lights of a new residential/business area that’s being built, and walked to a small park on one of the main streets. Then we drove to the spectacular 70-acre WW2 Memorial Park with the amazing tall obelisk, beautiful red fountains and gorgeous floral clock. We walked the length of it, enjoying the peaceful atmosphere and beautiful surroundings. Finally, we went back to Red Square which was more visible with much scaffolding, etc, removed and quite spectacular with the lights. We had a much better impression of it than in the morning. Back to the ship and bed shortly after midnight. After breakfast we took the bus to the Kremlin. It was much warmer and sunny, so we enjoyed being outside. [Inside the Kremlin, an enormous walled “official” area,] we toured the inside of one of the cathedrals, the Asumption, seeing many old and even ancient ikons, and the many palaces, churches and other buildings [ amazingly old, colourful and intact ], ending with a tour of the Armoury. The Armoury is really a museum holding very many treasures of the Tsars: everything from coronation gowns and works of art to carriages, Sèvers China to Fabergé eggs. This was followed by a picnic box lunch in a nearby park, then onto Tretyakov Art Museum, one of the best art collections in Russia. [ the route to the gallery took us over the Lock bridge where brides and grooms come to place a lock to ensure a long and happy marriage – on return we witnessed one new couple placing their lock ]. Our terrific guide led us to several highlights of the collection and in about 90 minutes showed us a very wide range of Russian art. Back on the ship we watched Moscow disappear as we departed for our voyage. The captain hosted a welcoming reception followed by a delicious, multi-course dinner. At 9 the social crew provided “Getting To Know You” entertainment in the big lounge, followed by music and dancing. We watched the boat go through a lock from the deck and met a couple from Ottawa. Larry joined some of the guys [ Dave McN and Pepper M ] for a beer, but I was ready for some quiet time in our cabin and bed. A leisurely start to the day with coffee in our room, then a delicious breakfast. We took several circuits around the deck to get our blood going. Marina gave us an introduction to the next few days, then we had a lecture by Lillian on Russian literature. She’s delightful, digressing frequently with interesting stories. That was followed by a presentation on the various types of Russian “applied art”. Then a drill – going to our rooms, donning our life jackets and being inspected by the crew. We passed. Lunch was another delicious meal and in the afternoon we hand an introductory Russian lesson. At 4:30 we disembarked for a walking tour of Uglich – two churches, a beautiful concert, wonderful ikons and the story of Dmitri, heir to Ivan The Terrible, who was murdered there by lackeys of Boris Gudinoff. There’s a hruge market here, but we bought only batteries for our alarm clock. Then we were whisked off to the home of Olga for dinner. She lives in an old apartment building a few miles from the dock. Twelve of us crowed ‘round her table and she served cabbage soup, potatoes, cole slaw, carrot salad, herrings, sweet rolls and a great deal of vodka. This morning was chilly and rainy, but after breakfast we got off to a good start with a talk on Russian Vodka - lots of interesting facts and some recommendations. That was followed by another lecture on Russian history by Liliana – she is so easily tempted to stray off topic, but has many fascinating stories. After a delicious lunch, we boarded buses into Kostroma. This was a wonderful tour – the first one the Russia I was hoping & expecting to see! Kostroma is a lovely old town, with a thriving linen manufacturing industry. The Ipatiev Monastery is closely tied to the Romanov family history & is a lovely place. There we heard a most amazing choir sing the Volga Boat Song and ( I think ) the Lord’s Prayer, admired a beautiful church & toured the small Romanov museum. It is now a functioning monastery after many, many years out of business under Communism. Then we toured Epiphany Cathedral, where there are many ikons, and relics. It is run by a community of very strictly-ruled nuns whose convent adjoins etc. The next stop was the downtown market. It’s prosperous now, with a wide variety of fruit & vegetables, meat, poultry & fish as well as clothing and small house wares. We picked up some wine and vodka at the liquor store. The walk across the central square was most enjoyable. It’s a pretty place. Back at the pier there was a small market set up, so many of us shopped. Dinner tonight was Ukrainian, and most delicious. Then we had a Russian dace class in the lounge. The dancing was had enough to master, but harder still was the particular Russian sound we had to learn – across between a shriek and a whoop. It was fun and good exercise. We have an early day tomorrow, so hope for good sleeping tonight. It just keeps getting better. Today we were in Yaroslavl, a lovely city, and the weather was beautiful. At breakfast we met 2 American guys who told Larry that one of them, Ed, was heading straight for the internet café. Larry decided to join him, so I was on my own with instructions to take lots of pictures. We stopped near the late 17th century church of the Epiphany for photos. It’s lovely with ceramic tiles on the outside walls. Bells were ringing and a service was going on so we didn’t go in. Next stop was the Society of Artists where we admired local art and saw many lacquered boxes from 4 cities that are famous for them. Myrna entertained us at the grand piano in the concert hall. At the Transfiguration Monastery we enjoyed a bell-ringing show and a walk through the grounds, where we saw an orchard, rose garden, wonderfully eccentric wooden beehives and linden trees (a.k.a. “lime trees” in UK). At the Church of St. Elijah the Prophet we heard the story of how the use of the church by the Soviets as a storage warehouse for felt boots saved the frescoes from destruction. It seems the boots absorbed moisture and the frescoes stayed dry. There is also a small “winter church” where we heard an excellent choir. Back at the city centre we crossed paths with Larry who was going with another group to St. Elijah’s. Dave, M-E & I wondered through the market and picked up some snacks and beer. We were back on the ship for lunch, then actually had free time until late afternoon. I went o a “master class” on blinys ( Russian pancakes ), then met Larry in the restaurant for a bliny-tasting party with caviar and several kinds of vodka. We’re mastering the Russian way of drinking it down in one gulp after screaming “nazdarov’ye”. Just before dinner we passed through a large lock into a lake [ the Rybinskae Reservoir ]. We were invited to the upper deck to see the Lady of the Volga statue and enjoy the sunset. After dinner was the “Mr Cruise” Show in the lounge. Larry has sworn me to secrecy, so we’ll see if he blogs this – there were 5 candidates/competitors, including Larry and Dave McNaught. They competed in 5 things – poetry ( reading Humpty Dumpty while expressing some mood. Larry’s was “you’ve been offended by your grandmother”); haberdashery – sort of musical hats; weight lifting; acting; and dancing. In the end Larry was declared “Mr. Poet” and Dave “Mr. Cruise”. It was all quite fancy and garnered and official certificate and a bottle of vodka. After breakfast I headed off to a class on decorating nesting ( matrushka ) dolls, while Larry spent time catching up with all the photos and videos from yesterday. We bought blank dolls and then were given very brief instruction and the paints, pencils, brushes, water and some example. Some ladies turned out beautiful dolls; mine were less-artistic of course, but I had fun and am not too embarrassed by the results. Shortly after that we attended another Russian lesson – it’s terrible how little sticks! [ the problem is the darn Cyrillic alphabet [ Larry is “]Љарри” in Cyrillic ]. After lunch we disembarked at Goritsy village and took shuttles to Kirillov and Monastery of St. Cyril of the White Lake. At the museum there we saw many really gorgeous ikons as well as St. Cyril’s personal belongings. The flowers were lovely on the grounds. It seems their season is several weeks behind ours. Odd. The two villages are interesting for their colourful wooden houses. We did a bit of shopping back in Gorisky, then boarded for the next part of the voyage. But there’s never a dull moment, so in the late afternoon we went to a Russian tea in the dining room. Some people had been to a talk earlier and instructed us on proper tea etiquette including drinking from our saucers! [ Grandpa Shaw used to do that! ]. After tea, the Intrepids had our Traditional hall party. But we were in the lap of luxury – we had a lounge to ourselves. We co-opted the services of a lovely Asian gentleman to take a group photo, and gathered ourselves together for dinner. After dinner was a concert of classical music which Larry is attending while I write this and nurse a miserable cold. A leisurely morning, with a walk several times around the deck and a 9am hymn sing. Our group was joined by a few other people and we belted out several old favourites. Then Larry went off to a lecture on Perestroika and its effects, while I relaxed and read in our cabin. After lunch we did a tour of the ship’s bridge and engine room. I’m glad I don’t have to manoeuvre this boat into those locks and through the narrow channels. Marina gave us a good description of the options available in St. Petersburg so we can sign up. In the late afternoon we docked at Kizhi and did a walking tour of this open-air museum of wooden architecture. Just amazing, with a couple of lovely churches [ the largest from the 14th century and others from the 17th and 18th ] , astonishing onion domes, and various houses and other buildings in remarkable wood construction. This was certainly a high point. Back on the ship we discovered that the dining room had been taken over by “pirates”. Luckily we were able to sing for them and were allowed to join them. We ended the day with a folk show by the Yarmark Trio. We’re travelling along banks of the rivers, lakes and canals where we’re seeing autumn foliage. It’s largely gold and yellow birches but a fair amount of evergreen and dashes of red show up too. It’s really lovely. We’ve all been discussing how well we’re treated here and how very good the local guides are. They recognize what we’ve already seen and acknowledge that by now we’re nearly experts on ikons having seen a few thousand. That means they tell us new facts we haven’t heard before, or only point out unique features. There is not the same push to buy that we experienced in China. They quietly offer goods from well situated stalls but are not at all aggressive. They don’t bargain as much though. This morning was the fourth lecture and included the young women on the crew explaining their education, their opinions on life in Russia during communist times versus today, their aspirations etc. Unfortunately the room was highly scented from cleaning products and I had to leave. Larry enjoyed it. He said that one young woman indicated that she wouldn’t attend a state-run university because marks were altered by bribery and the education wasn’t as good as at the privatized schools. [ one also indicated that the tuition she was paying was US$2000 per year. Prof. Liliana took issue with the bribery statement [saying that it certainly didn’t apply to her]. When asked about health care, it seems they have a 2-tier system with the public tier being very unsatisfactory. Late in the morning we went ashore at Mandrogi where I browsed through various craft workshops, small domestic museums and souvenir shops while Larry put in some quality internet time [ well, low quality as I couldn’t use my laptop – just a usb memory stick ]. After lunch we rehearsed the Canadian act for the concert tonight [ yes, apparently have to perform. I thought I did my bit the other night ]. Naomi has us singing and moving like a well oiled machine. Because of his win as “Mr. Cruise”, Dave McNaught was the MC of the talent show. He did a great job and we all had a really good time. Our Canadian group led off the show with 3 camp songs. We all dressed in red and white and carried flags and had Canada balloons; many of us had Canada stickers, etc – crazy! At the end we tossed chocolate loonies and townies into the crowd. We were followed by Carol Cosgrove singing Coal Miner’s Daughter as a tribute to the Nova Scotia mining community. Then Myrna Torrie played a selection of songs from Fiddler On The Roof. Canada did well [ maybe overwhelmed them – but that’s OK because we ARE more than ¼ of the ship ]. Other individuals and groups did a great job too. It was a terrific evening. At the end Dave asked all the Russians to sing their National Anthem. There was a scramble to assemble their musician and instruments, and it was goose-bump raising. We’re in St. Petersburg! What a wonderful city! We started off with a bus tour of the city. The first stop was the Church of the Spilled Blood which we saw only from the outside. Then similar stops at St. Issac’s Square and Vasilievsky Island. After lunch came what was certainly a highlight of the trip – several hours in the Catherine The Great’s Winter Palace and the Hermitage Museum. Our guide was very good – walking us through parts of the buildings and talking about selected items. We were most impressed by the interiors, but enjoyed the works of art as well. We stayed on for an hour or so after the tour, then struck out looking for dinner Maria-Angelica. We didn’t find anything in the first few blocks of the Nevsky Prospect, so grabbed a burger at MacDonald’s and then strolled back through parks and squares to the banks of the Neva. We sat on the river wall across from the Hermitage Theatre until others began to arrive, then joined them for the ballet, Giselle. It was the first ballet we’ve seen in years, and really enjoyable. The theatre is beautiful but not too comfortable. The crew provided a late snack for us when we returned to the boat. What a lovely day. We left by bus for Peterhof, and it was a lovely drive. We passed a huge “broken ring” memorial to the million people who died in the siege of Leningrad during WWII. Then few went past amazing dachas to the palace grounds. We didn’t enter the palace itself, but spent most of our time in the gardens. The fountains are just astonishing and apparently don’t rely on pumps. They are all over the grounds but the most spectacular are in the centre. It was so nice to walk through golden autumn woods. We toured Mon Plaisir, a smaller castle on the grounds – beautiful and elegant . Then we came back to the ship by hydrofoil. We just had time for a quick lunch before rushing back into the city centre for a canal cruise. This city is called the “Venice of the North” and the views from the canals and rivers are spectacular. Many palaces and other beautiful buildings, bridges, parks and so on. What a marvellous way to end the trip! In the morning we took the bus to Tsarsko Selso and toured the Catherine Palace, which is absolutely mind-blowing -- lots of gold and mirrors, high ceilings, endless corridors, inlaid floors, silk, ebony and every kind of art. The walk through the gardens gave us another welcome taste of fall. The sunlight through the golden leaves was magnificent. It’s gorgeous, but so over-the-top we all agreed that no one would blame the common folk for staging a revolution. In the afternoon we returned to the city centre where we first visited the interior of St. Isaac’s Cathedral. This was a most unusual Russian church. The icons were all mosaic, rather than painted wood. The Royal Gate between the nave and altar was very wide and made of open ironwork. Behind the altar was a huge, beautiful stained glass window of Christ. The interior is marble veneer and many paintings. In the highest steeple we could see a dove floating. From there we continued to the Peter & Paul Fortress for a visit to St. Peter and St. Paul Cathedral. This is where all thr Romanoffs are entombed, for the most part in white Carrera marble. The church itself is unusual in that it doesn’t seem to be square like other Russian orthodox churches. It also has much larger windows than most and so is naturally brighter. A small chapel in the back of the church has memorial plaques for the last emperor, Nicholas III and his wife and family ( except Anastasia and Alexei whose remains have not been identified ). They were reburied under the chapel, with great ceremony, in 1996. It’s very touching. Back at the ship, we gathered for last “hall party” and presented Cathy with a gift for arranging this wonderful trip. At dinner we wished our terrific waiter, Andrey, a sad farewell, and then sang “Go Now in Peace”. We were joined by several other people in singing it. Then everything broke into general revelry before we retired to our cabins to finish packing for the trip home.